Photo credit: Sparks-a-Flyin’ by Mike Cherim. Sometimes it’s nice to have a fire. It can be a source of comfort while keeping the night at bay and warming the soul. And it’ll warm us in other ways, too, from toes to fingers, from gathering the wood to sidling up to the blaze, just watch that you don’t burn your socks or melt the rand or sole of your boots. By fire, of course, we mean a legal fire: a fire not too big, made in a legal place, done in a reasonable way, at the right time, and for the right reason. And then properly and thoroughly extinguishing after it serves its purpose. This article is going to define the characteristics mentioned. Then once we uncover what exactly the right fire is, we will offer suggestions and insight on how to start, maintain, then extinguish it. First there are the rules published by the agency or authority who manages the land, i.e. Private, Town, State, National, Conservancy, or other. Refer to a map for section identification of areas and location of boundaries. Second there are the seven principles or rules of LNT (Leave No Trace) which in a nutshell allow for gravel/sand bar fires, pan fires, mound fires, or fires in designated areas only. These fires should be small, only as large as necessary as defined by their purpose, and comprised of fuel only as long as the fire site and no thicker than your wrist. And last, there are the rules of nature which should be dictated by common sense. A few of examples might include be not having a fire when fire dangers are high, not building a fire among combustible materials, or choosing a location that could put the fire out such as directly under a snow-loaded fir bough in winter. Town forests or parks will typically not allow fires, though some may offer devices for picnicking and day use like fixed grills for charcoal cooking. Conservancies, like that above, will typically not allow fires, though some may offer devices for picnicking and day use like fixed grills for charcoal cooking but that’s uncommon. 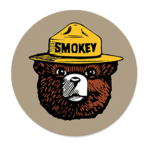 State forests and parks will typically not allow fires as well, though like town forests may offer fixed grills for charcoal fires as well as fire rings in designated campgrounds for wood fires. National forests and parks will generally allow fires in locations outside of the designated forest | protection | areas (links point to USFS overview maps (PDF)). This also includes federally designated wilderness areas, but do note there are several restrictions as it pertains to fires and camping near trails and waterways. See the WMNF backcountry camping rules (PDF) for specifics. Instead of choosing a fire site, let the site choose you. This means you’re advised to use an existing campfire ring instead of creating one. First of all, if one doesn’t exist, it’s probably because the rules simply don’t allow it. So what about impacted sites in illegal places? Let’s say you arrive at a designated wilderness tentsite where fires clearly aren’t allowed — and you know this for sure because there’s signage telling you so (not that ignorance of the law is an excuse) — but there’s an awesome fire ring and it’s plain to see there have been a few fires there. What should you do? Well, the rules are pretty plain so the answer is of course not to build a fire, even if others have done it before you. This is common sense, right? Think of it another way: if you find a pile of trash in the woods, does that mean you can litter, too? Two wrongs don’t make a right, as mom used to say. Do you know what the forest service does when they find fire rings where fire rings don’t belong? If you’re thinking that they break them up, disperse the remains, and try to make it look as if there was never a fire in place, you’d be correct. They are trying to avoid a situation like the one described above. Now that we have covered some of the rules about Where we can have fire, and covered some of those who write and enforce the rules, let’s delve a little deeper. Where we make fire is really defined by the rules and those who make and enforce them noted above. So what’s left is the When, Why, and How. In this section we will look closer at the first two saving the How for a latter chapter in this article. A fire is a big responsibility and it requires some time and effort to manage properly and safely. Because of this, it’s important that we ask ourselves the why question? Below are some of the answers to this question along with some rebuttals. Unless you’re on a date and need mood lighting, campfire light is really unnecessary. An inexpensive solar-powered Luci lantern is a lightweight, convenient, and safe-to-use alternative. A headlamp — which is required gear anyway — strapped around a water bottle with its light shining into it makes another great alternative. If you’re till insistent on having that mood lighting for your hot datecamp, try a candle. Ideally you will have with you sufficient clothing layers and sheltering for the weather, your exposure to it, and its duration. But there may be times when supplemental heat is wanted or needed. While no outdoor fire will be very efficient, and since making fire within a shelter without adequate ventilation is hazardous due to the possibility of carbon monoxide poisoning, the outdoor fire is what we will settle for without having to get more elaborate. It’s perfectly fine to create a very small bed of coals for cooking where allowed, but it’s a longer process, a more challenging process, and of course riskier than just using a proper backpacking stove. Thus we suggest if your only objective is to cook with a pan or pot then use a stove with either a solid fuel like an “Esbit,” butane/propane canister like a “JetBoil” (great in warm weather or by insulating the fuel canister in cold weather), isopropyl alcohol (homemade can stove), or liquid gas (Pocket Rocket). Reserve the use of fire for grilling and smoking meats, fish, or for making s’mores. There are several ways to source water in the backcountry, but many of which will require some sort of treatment to make them potable. This can include mechanical filtering, use of chemicals, solar distillation, or by using ultraviolet light (i.e. SteriPen). Another old school but effective method is boiling it for three minutes — though conventional wisdom suggests less time is needed due to build up temps doing the job while the water is coming to a boil. Such as we suggest above, a cook stove will do. While it is possible to dry clothing, boots, and gear with a camp fire, it is difficult, not very effective, and it may endanger the very articles we’re trying to dry. Between the intense heat and sparks, bad things can happen. The best way to dry stuff, articles of clothing in particular, is to wear them and start hiking or get some exercise. Our body heat is very effective. Just beware of hypothermia, especially if the wet articles are made of cotton. Also note that one needs food fuel (energy) to make this happen. Bears, bogeymen, and bugs hate smoke and fire. It’s true. These are some real uses for fire — or a smoldering smudge if pest control is your only objective. Of all of fire’s qualities, at the end of the day a fire can raise spirits, squelch fears, and give us comfort. This is not to be overlooked in its importance. When to Have a Fire? This is a simple question to answer. You can have a fire whenever you want provided it’s allowed, safe, and done with Leave No Trace in mind. If the want or need to have a fire, your why, is strong enough to warrant the time, effort, and commmitment involved, go for it. Also bear in mind, “LNT is not anti-fire,” says LNT Education Director, Ben Lawhon. This segment covers the elements of a fire, how to build and start it, store it, and then later extinguish it, all with LNT, personal-, and environmental-safety in mind. In order for fire to happen three elements are needed: heat, oxygen, and fuel. If any of these is missing, fire cannot fully happen. In some cases this may be to our advantage. Let’s dig into these elements further. Using a lighter or matches to produce an immediately open flame is a sensible and convenient method. Natural sources of flame or embers may include lightning and wildfires. Copious amounts of sparks up to 5000°F can be produced from steel striking an artificial purpose-built “ferro” or ferrocerium stick or metal match. 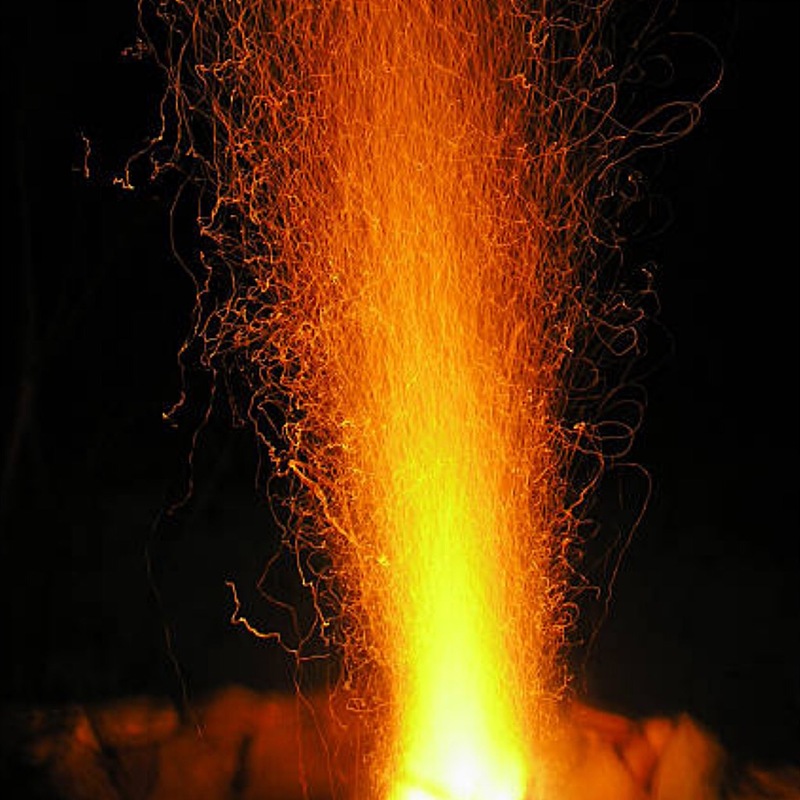 Sparks may also result from steel striking flint or even quartz, as well. Heat from rubbing, friction, can effectively produce an ember. This may result from using a hand- or bow-drill, or a cotton and ash fire roll. A more obscure friction source is via compression which effectively rubs molecules together. Solar by way of magnifying the sun’s rays through a convex lens or Fresnel lens, or off of a concaved reflector into tinder or firestarter. Do beware, however, that solar methods are akin to staring at an eclipse of the sun; it may be dangerous to our eyes so care must be taken to protect them. Stored heat such as from a carried ember or hot coal. With more fuel and oxygen, this can easily become fire again. Blowing or fanning the beginnings of fire will add oxygen increasing the amount of heat. Blowing an ember nestled in a tinder fuel bundle or “bird’s nest” will cause the fuel to first smoke then ignite. When building a fire one considers this by building the fire (see below) in such a way to create a draft or airflow generally from the bottom of the fire to the top. Since heat rises, the fire actually aids this process. Fuel for the backpacker’s fire is primarily composed of dry wood of varying sizes ranging from tinder to logs, though other dried materials such as certain barks, mosses, tree fungi, and the dung of certain animals is also used in places. The latter, in particular, is a common source in parts of the world where no trees exist. Someplace legal and proper, of course. In a place with limited flammable duff around it. Being aware of locating it where roots won’t burn. Being aware of what’s overhead (extinguish or spread?). Create an LNT-accepted mound on foil with erroded soils. Use an LNT-accepted “fire pan,” roasting pan, or frying pan. Dig into gravel or sand bars along waterways, per LNT. Being aware of what’s overhead and whether or not it can spread or extinguish the fire once built, locate your fire site (unless one is present in which case use it). Assuming a standard teepee-type fire, or LNT-accepted mound fire on foil with erroded soils, roasting pan or frying pan fire, or gravel or sand bar fires along waterways, begin with some sort of log base, especially in wet conditions so as to keep your tinder off the ground. Fine, dry tinder, grasses, pine needles. Cotton balls with petroleum jelly (a favorite). Char cloth or char materials. Courser tinder up to 3mm~ in thickness. Kindling sticks up to 1cm~ in thickness. Small sticks up to 2cm~ in thickness. Medium sticks up to 4cm~ in thickness. Logs up to wrist thickness (per LNT). Please note: This type of wrist-sized fuel may be broken into proper lengths safely without the need of a saw or axe, or by jumping up and down on it. This can be accomplished simply by leveraging a longer branch between two closely-spaced trees and pulling laterally. This is physics at work and physics is our friend. Have at the ready water or sand for extinguishing the fire before even beginning this process. Use a butane lighter or wax-dipped matches to flame-ignite a flammable tinder. Use a ferro rod and fire starter such as petroleum jelly cotton balls or char cloth. Use a baggie with water or compass magnifier to concentrate the sun’s rays. Make a “fire roll,” have it at the ready, and use flat rocks or logs to start it (search online for details). Slowly add larger and larger dry fuel materials as the fire grows until a strong steady blaze unaffected by the wind or other elements has begun. From there even damp materials can dry and burn. Be sure to burn log ends and other debris (not trash, though, as that is packed out) as part of the ongoing process of controlling your fire and leaving as few remains as possible. Make a hole in the material so as to tie a cord to it. Locate the hole away from the surface to be burned or charred. Before tying on the cord, burn or char the material over open flame or coals until a significant ember forms. Do this on the side opposite the cord tie-in. Using a stick, remove the smoldering material from the fire and tie on a flexible cord by way of the hole you created. To keep your portable ember alive, you can safely swing it by the cord in a small circle to increase the oxygen. A roll of white or red cedar bark can smoulder for hours just as the materials above can, but it may be more difficult to carry and scarcer here in the Northeast. Much like the horseshoe fungus described above, dry punk wood (dry rotted wood) can smolder for an extended period provided it’s not completely oxygen starved. A cigarette may offer a five minute ember capable of starting tinder. A cigar or pipe will last several times longer. All that is required is an occasional puff to keep the ember alive (especially cigarettes which contain fire retardant chemicals). That said, these methods may kill you so we can’t really endorse them. Last but not least, whenever we will abandon our fire or will be unable to supervise it, it’s time to put it out. To be clear, we are discussing extinguishing fire that is fueled by wood-based, wood-like materials, not liquid fuels like gasoline or alcohol, gasses like butane or propane, or electrically-generated fires. While smothering methods will work for these other fires, using water as described below can spread the fire or shock you. A Nalgene or similar wide-mouth drinking container. Pressurized hyrdartion bladder (by inflating or squeezing). A collapsible canvas or plastic dedicated camp bucket. Splashing from the water source, if the fire is close enough. Camp cups (using multiple cups for volume or to aid splashing). A square of cloth, though it will leak quickly. A shoe, hat, pant leg, boot, etc. (desperate times). And last but not least, peeing on the fire will help put it out. Important: It should be noted that some of the methods described may utilize precious drinking water or compromise a “clean” vessel with “dirty” water. This is solved with planning ahead and being prepared to start and stop the blaze. Soak the fire with copious amounts of water until no flame, smoke, steam, or sound is present. Using a stick, stir the fire and its periphery carefully looking for more signs of embers or smoldering. Soak the fire one more time, even if no signs were noted. The water should soak into the ground under the fire. Once the fire appears fully extinguished move your hand over the ground to check for heat. Cool as necessary. Using rootball dirt or sand, add material to the fire much as you would with water being sure to fully extinguish any sign of flame or smoke. Stir with a stick as needed for coverage and add some more. Then simply wait to ensure that you’re not actually storing the fire. This method involves plenty of time and is not ideal. That said, the wetter the sand or the more clay-like the soil, the faster it’ll be thoroughly starved of oxygen and the fuel will go out. Again, it’s important to ensure your fire is well stirred and fully extinguished, above and below ground, and that there is no sign of flame, smoke, steam, sound, or heat. Putting the fire out is just as important as getting it started. Embers of Thought: Fire IS Okay! If you’ve read this far you know we’re not against having a fire — and neither is the LNT organization or Forest Service. Everyone enjoys a nice campfire. It is a center of light and warmth; the soul of our camp. The smoke lends flavor to our food while keeping the bugs at bay, and it feels good to us to stare into the flames comfortable after a long hike as we quietly socialize. Fire is a varied and wonderful thing. Life without it would be hard, cold, and miserable. Fire is also dangerous and can turn on us in the blink of an eye. The demarcation between a controlled campfire and a raging forest fire is a thin one. It’s important that we know and remember this critical aspect to fire moving forward, as managing a fire is a huge responsibility and one that needs to be taken seriously, even here in the Northeast with our “asbestos forests.” Plan for fire, remember it’s impact as you do, and plan to put it out.